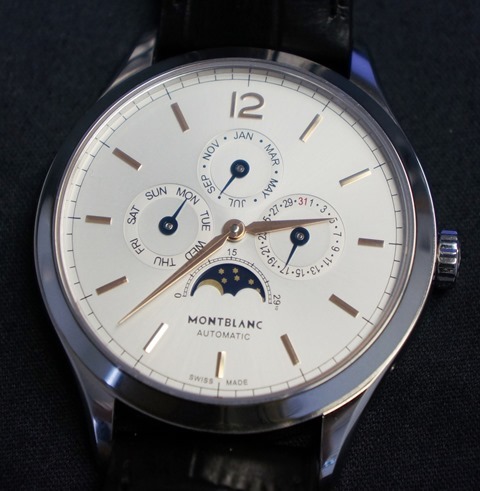 Montblanc was kind enough to lend me the Quantième Annual Calendar for a few days to size it up so to speak. 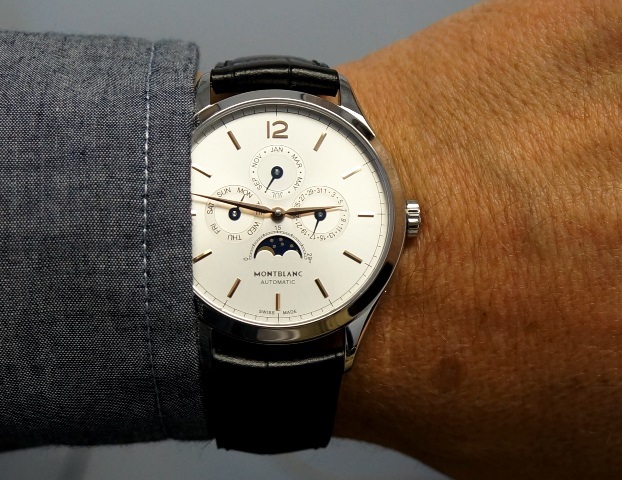 Much has been written about Montblanc's 2015 new Heritage releases including the Quantième Annual Calendar (the "QA" for short in this review) which I am going to comment upon below. 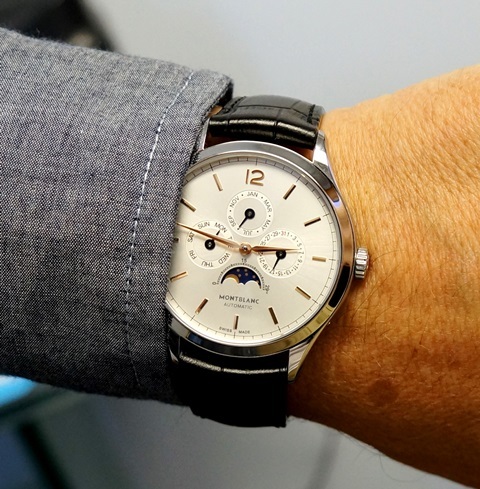 The QA bears a striking resemblance to the Heritage Perpetual Calendar which was released in 2014. 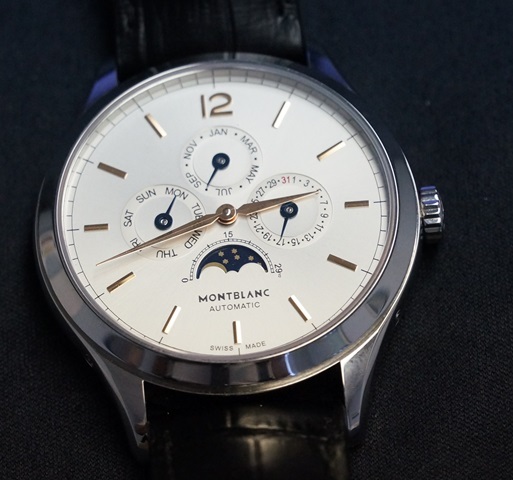 With the introduction of the QA, Montblanc now offers two different but "related" complications at different price points. Buyers now have two distinct choices to match their budgets! But that's not all. In fact, the QA sits nicely between the Heritage Complete Calendar (Chronométrie Quantiéme Complet - Ref 112538) and the Heritage Perpetual Calendar (Perpetual Calendar - Ref 110714). As an annual calendar, the QA only needs to be adjusted by hand once every 365 days at the end of February. The QA houses MB's Calibre MB 29.18 (Selitta SW200 base with an annual calendar module). The switch from the 28th or 29th of February to the 1st of March is easily accomplished by extracting and turning the crown. The case is a comfortably sized 40mm and only 9.5mm high. The watch features nicely shaped lugs which are not too short nor too long. 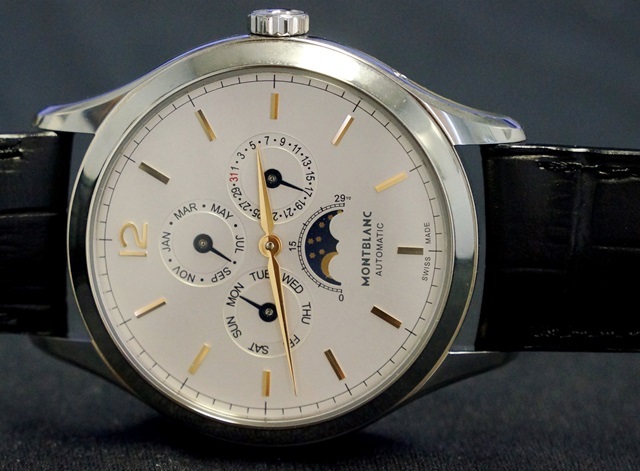 The silverish dial has red gold-plated applied indices, gold plated minute and hour hands and small blued hands for the annual calendar indications. 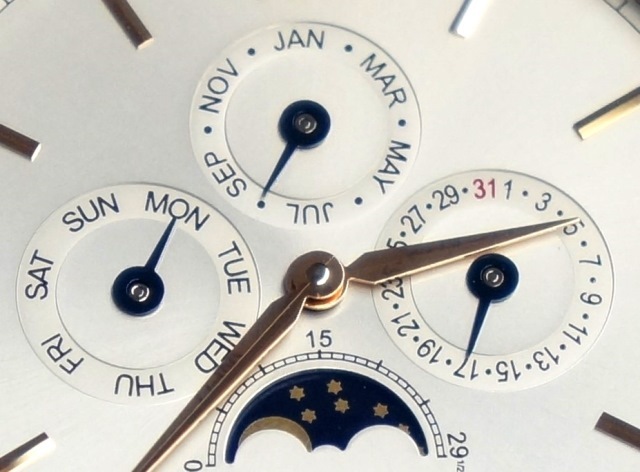 Push buttons are located on the side of the case to adjust the date, month, day of the week and moon phase. Upon opening the box and lifting up the QA, I couldn't help but notice how "classy" it looked. Sleek, elegant and pleasing to the eyes, it looked smaller than its stated 40mm size. I even had to take out my ruler just to make sure! However, the combination of its domed 3mm bezel and gently sloping lugs help complete this optical size illusion. Speaking of lugs, it is nice to see that Montblanc has made the lug width a standard 20mm allowing easy strap experimentation for those inclined to do so. The QA makes for a perfect dress watch given its size and proportions matched with its gold hands and indices against a silvery white dial. It will easily tuck under a cuff and become quite the conversation piece when it shows. 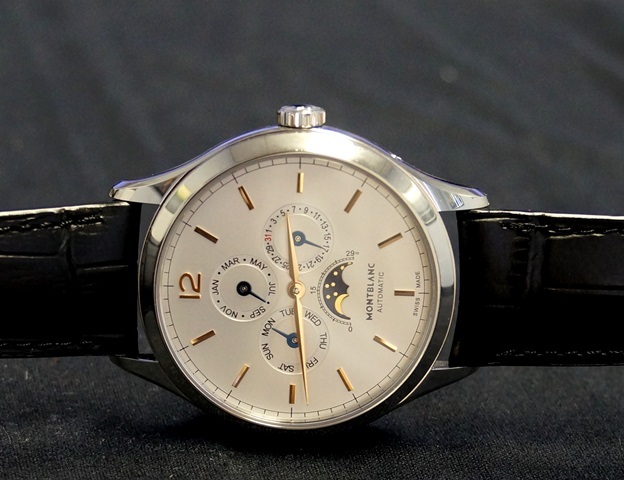 Sub dial placement was a highly debated issue on the Heritage Perpetual with many arguing that the sub dials were too closely spaced towards the center. The sub dials on the QA look to be sized correctly and their placement works well with the indices. I found it easy to read the time in all but the very darkest conditions. However, and this is a big however, my aging eyes had a hard time making out the date. Not impossible, but hard, requiring slight twists of the wrist to make the dates more readable. Conversely, the month and day sub dials, which are less cluttered, were easier to make out. You will have to decide yourselves. 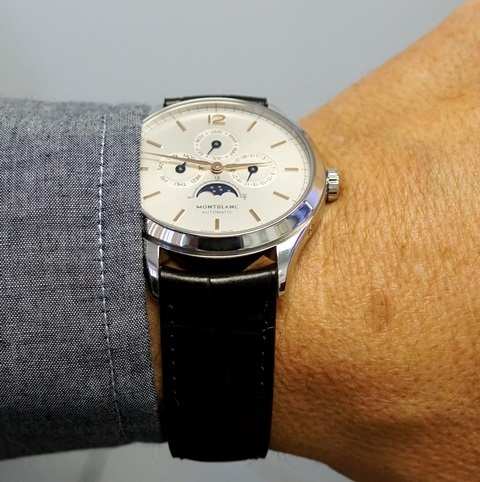 As stated above, the QA is a great dress watch and while it can be paired with more casual attire, I don't think it works as well as some other watches. It is lightweight and comfortable and dares you to stare at it. It looks and feels like it can punch above its weight class! The black matte alligator strap is well finished and exhibits a large scale pattern which I prefer over small scales. My biggest criticism is the double fold deployant. It works fine, is comfortable on the wrist and easy to adjust. 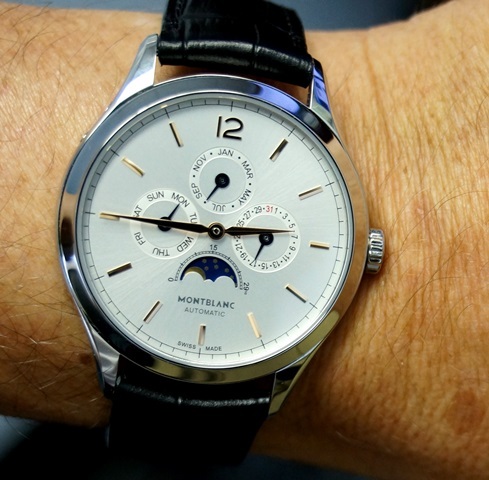 But it just feels "cheap and flimsy" and not in harmony with the rest of the watch. This is a small nitpick but I wanted to mention it nonetheless. 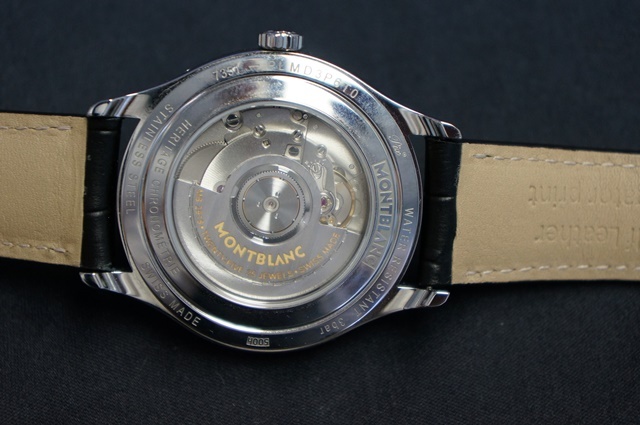 As for the back of the watch, the movement is viewable through a sapphire crystal. This is neither good nor bad. In my opinion, the movement is nothing special to look at. The finishing is acceptable but this is not a movement that will cause you to take the watch off your wrist and show it to your friends. But then again, this is true of many movements with see-through backs. The QA is a lot of watch for the money. I know its critics feel that the QA, along with other Heritage models, "borrows" many design features from its sister brand but at the end of the day, so what! If you want the models from the sister brand, it is there for the taking. However, the QA can certainly stand on its own merits and delivers across the board. Annual calendars are not for everyone but if you are looking for an annual calendar at a "reasonable" price ($6,800 retail) then the Montblanc Quantieme Annual deserves a look! Previous Topic: News on Timewalker Urban Speed w/ e-strap?